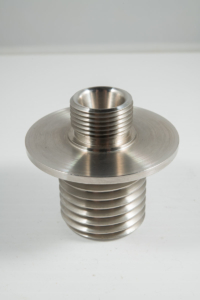 Our CNC turning services are the backbone of our precision machining operations. Our Mazak turning centers offer state-of-the-art programming and setup capabilities, allowing us to manufacture your parts quickly and with high quality. For longer production runs, we utilize our bar feeder’s unmanned material feeding capability, reducing manufacturing cost and turnaround time. Our decades of experience have allowed us to develop superior methods of cutting stainless steel and all materials very efficiently, giving you the best pricing and quality. With seven CNC Turning Centers and two CNC Lathes on the floor, have confidence we can meet any customer production needs. Chautauqua Machine Specialties’ machining centers used by our experienced toolmakers ensure that we will provide a part that meets your expectations. Our highly skilled toolmakers have decades of experience with CNC turning and have worked with the many types of materials shown above. We offer CNC turning and milling services for precision machined parts with very tight tolerances down to +/- .0002” and diameters from .187” (4.75 mm) to 11” (279 mm). With our Mazak CNC turning centers, we machine complex parts more quickly and more competitively utilizing our programmable software. We also have two toolroom CNC lathes for smaller precision projects that can be operated manually or in CNC mode. With our CNC lathes, we can provide increased flexibility when it comes to the size and types of turning operations we can complete. Also included in our CNC turning department is a Mazak 3-axis, dual-spindle machine with live tooling turning center. This particular machine enables us to complete a part with just one setup, thereby passing that cost savings on to our customers. Our dedicated and experienced team will be there to help you every step of the process. By working with CMS, you are putting your trust in a company that values our customers’ satisfaction. We work diligently to provide our customers with the highest quality finished goods possible. Our focus is on what you need, and when you need it. We can also perform secondary operations to help you get your parts finished under the same manufacturing roof.